Vacuum throughout (front and backs) including the pelmet, if any. Application of dry solution by hand, spray or cloth (depending on fabric). Wipe down with cloths to remove dirt and loose particles. Odourless product/chemicals so perfect for asthma sufferers, pets and children. 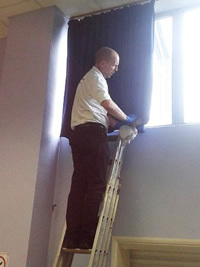 Cleaning curtains in situ can be quite convenient to the customer, saving the time and expense of taking to the local dry cleaner (not to mention the avoidance of shrinkage). 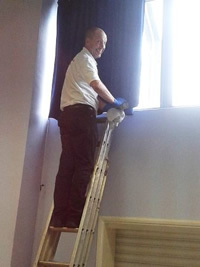 Our cleaning process would involve thoroughly vacuuming the curtains with particular attention made to the head linings (where sometimes dust collects). We clean these by hand from back to front in a methodical fashion and closely inspect during the cleaning process. 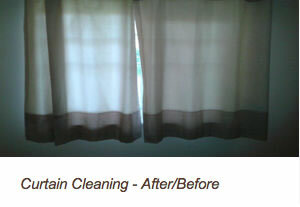 We’ll even clean the pelmets, leaving your curtains revitalised and smelling fabulously fresh! Being an advanced member of the NCCA you know you are in safe hands! Our team cover the following areas, and in between. If you need your carpet cleaned or a cleaning service, why not get in-touch?